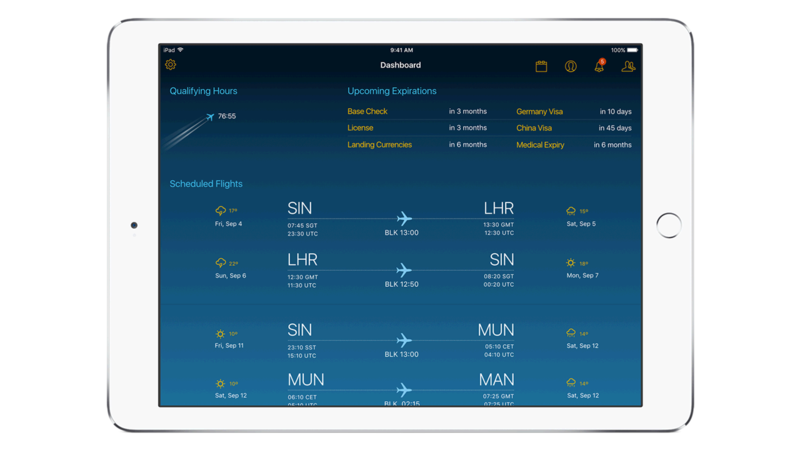 IBM MobileFirst for IOS Flight Roster gives pilots a view of all roster-related information to enable them to easily prepare and plan flight missions. Real-time access to consolidated flight roster, flight qualifications and other mission critical information throughout the day enables pilot to proactively adjust plans. Top notifications and alerts are highlighted for the pilot based on defined priorities. Analytics can prioritize critical focus areas based on past mission on the same route by different pilots and next best action recommendations can be used to improve performance consistency. Touch ID enables secure log in for pilot to access personalized content and information. Alerts, notifications, reminders and calendar entries help pilot keep pace with dynamic schedules. iMessage and FaceTime facilitate collaboration between colleagues assigned to same mission. Pilots can better prepare and plan flight missions with a single, real-time view of flight roster information coupled with prioritized alerts and notifications enabling pilot to proactively make required adjustments. Route qualifications are automatically published and available to the pilot preventing disruptions to the pilot’s roster due to non-qualification. Through its service plan. IBM and Apple have teamed up to provide you with the most comprehensive support available. It includes 24/7 phone support from Apple and next-business-day on-site service from IBM. Whether buying or leasing devices, the IBM flexible procurement model enables you to go from procurement to deployment quickly. You can also manage all your iOS devices from a single portal and effortlessly apply security policies that ensure data protection on every device. Stay on top of the boarding process with up-to-date information.